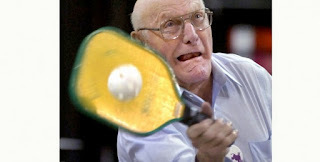 Now through December 20, the Greensboro Sportsplex will offer clinics for two non-traditional sports, pickleball and chair volleyball. Clinics will be held on Tuesdays from 9:30-11:30 am for seniors 55 years and over. Sessions are designed for all levels of ability. The game of pickleball is played with a wooden racquet and combines elements of badminton, tennis and table tennis. Chair volleyball is played with a beach ball and a modified volle'yball layout. The clinics are free of charge and pre-registration is not required.